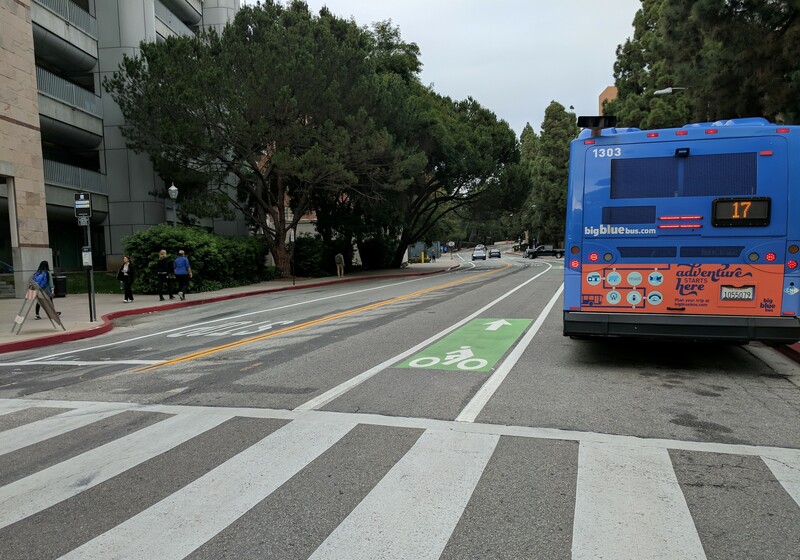 UCLA continues to demonstrate its commitment to multi-modal infrastructure with the newest improvements to its internal street network. 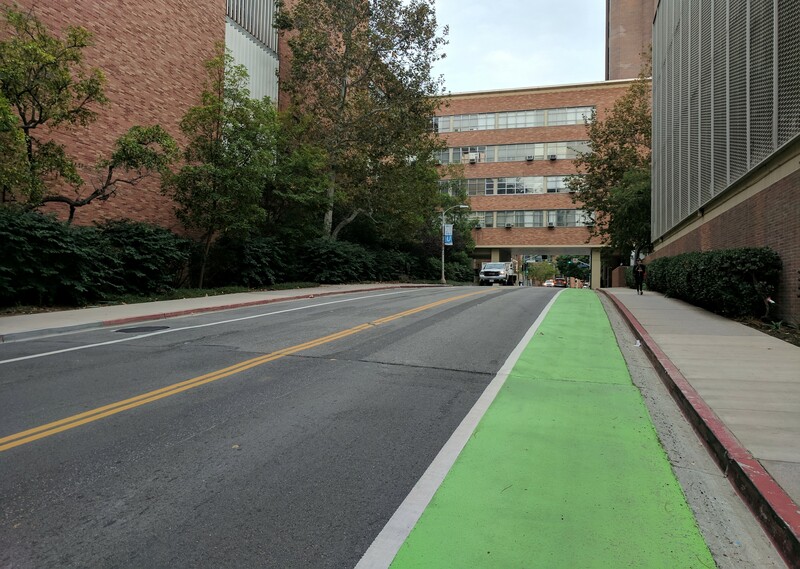 In October, UCLA Transportation completed a 0.6-mile bikeway on Charles E. Young Drive between Westwood Plaza and Dickson Court. In the northbound direction, the facility is designed as a continuous Class II bike lane. Southbound, the facility includes green-backed sharrows from Dickson Court to Westholme Avenue, and bike lanes from Westholme Avenue to Westwood Plaza. Green paint is used liberally to provide extra visibility, especially at conflict zones. This asymmetric treatment, from Dickson Court to Westholme, with an uphill bike lane paired with downhill sharrows is used in many U.S. cities, but is rare in Southern California. Another notable element of the design is how the lanes weave around Bruin Bus stops rather than merging with them. The new lanes follow many similar improvements made in the last six years, including green painted lanes and a bike box at Strathmore and partially painted and protected bike lanes along Westwood Plaza. 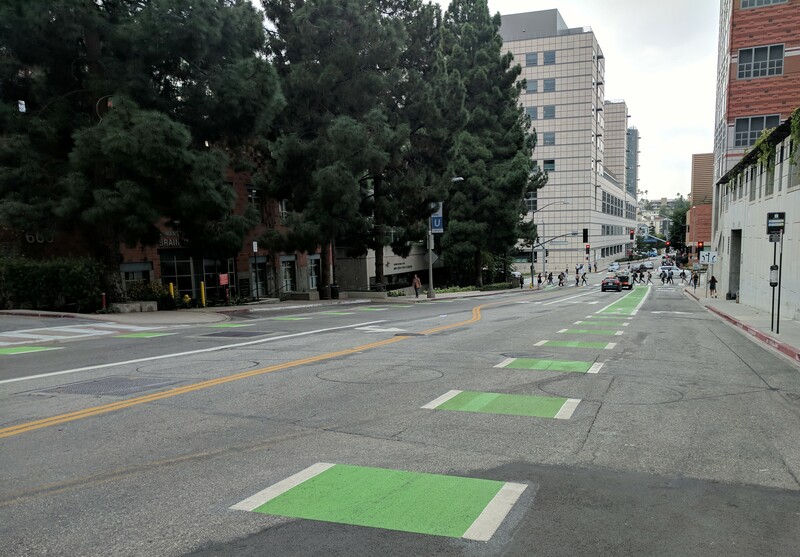 These street design improvements complement other UCLA investments in multi-modality and safe streets, such as the one-year-old Bruin Bike Share and the Twenty is Plenty speed limit reduction. While all these improvements have made the campus a safer place to walk, ride, and scoot, it remains challenging to travel to and from UCLA via active transportation. To the south, L.A. City Councilmember Paul Koretz has opposed the installation of bike lanes on Westwood Boulevard through Westwood Village, even though it would be possible to install bike lanes without removing vehicle lanes. To the east, the rush hour bus- and bike-only lane on Wilshire Boulevard through the Los Angeles Country Club (nicknamed “the gauntlet” by cyclists) is frequently used by scofflaw drivers traveling at harrowing speeds. Commuting from the Westside also remains challenging, with no high-quality bikeway directly connecting to the campus. New political developments may, however, create pressure for more infrastructure. A movement led by UCLA students has created a new neighborhood council in North Westwood. And the successful Westwood Forward slate of candidates who recently were elected to the new board made bike infrastructure central to their platform. Scott Epstein is the Chair of the Mid City West Community Council and a Research Associate at UCLA’s National Center for Research on Evaluation, Standards, and Student Testing (CRESST). It is nice to see the UCLA campus making so many safe-street improvements. However, if the city of LA and its’ civic leaders will not make the same kind of improvements on the surrounding streets such as the above mentioned Westwood and Wilshire and even Sunset all the good work will be for naught. Students, visitors, faculty and staff need to get to the campus safely. Currently most people are forced to drive and then park their car. Thank you for the update and all the photos. Such a stupid move. Hardly anyone rides a bike on UCLA campus except for a handful of hipsters. On the other hand, they removed hundreds of useful parking spots, reducing the number of available parking spots, yet a monthly pass is now priced above $100/mo., and the price keeps going up. Welcome to Agenda 21.